For customers in a home sharing arrangement, it's critical to review these endorsement to make sure they are covered. There are currently 10, or more, home-sharing companies operating in the USA. They connect travelers looking for rentals ranging from spare rooms, apartment size units to mansions worth millions of dollars. These can be extremely short-term (over night) or longer. In March 2017, Insurance Services Office (ISO) introduced revisions that reinforce the longstanding scope of coverage under the ISO Homeowners Policy Program as it relates to the role of primarily covering the named insured and, in general, other residents of their household; and makes available optional broadened coverages for home-sharing activities by an insured. The "main" endorsement is HO 06 53, Home-sharing Host Activities Amendatory Endorsement, for use with the HO-3. The "short version" of the endorsement is that all property and liability coverage for a home used in a home sharing service is excluded. According to the ISO rules, use of this endorsement is mandatory unless Broadened Home-sharing Host Activities Coverage is purchased. 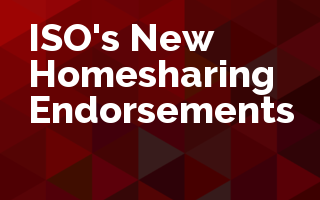 In response to the "take away" endorsement, ISO has filed a series of broadening endorsements (HO 06 63, Broadened Home-sharing Host Activities Coverage Endorsement, for use with HO 00 03). These endorsements are optional to use. For customers in a home sharing arrangement, it’s critical to add the broadening endorsement if the insurer will do so. How do you learn if your customers have a home-sharing exposure? Exactly what the exclusionary endorsements say. What coverage can be 'bought back'. Is there any coverage available from Home-sharing Companies?